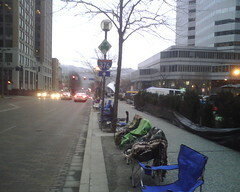 I took this picture at 7:30 this morning – the chairs are lining up for the st. Patrick’s Day Parade. I happened to be awake early, very early this morning to drive someone to the airport. Since I was up I thought I would drive through downtown to see how early people set up for the parade. The answer is very early. Pittsburgh is serious about St. Patrick’s Day sort of like they are serious about the Steelers – I wasn’t able to get a picture but there was one family setting up their chairs on the Blvd of the Allies that had their Steelers banner hanging from their table.